Kevin Emerson's Exile trilogy combines the swoon-worthy romance of a Susane Colasanti novel with the rock 'n' roll of Eleanor & Park. Filled with infectious music, mystery, and romance, the electrifying Encore to an Empty Room, the second book in the Exile series, doesn't miss a beat.Summer always wanted Dangerheart—the band of talented exiles she manages—to find success. Now that they've become an overnight sensation, they are on the verge of a record deal, and all of Summer's hard work is about to pay off. All they need to do is find the next missing song. But are Caleb, the band's future, and the lost song more important than college? Summer will have to decide. It's time to choose who she wants to be, even if that might mean kissing Caleb good-bye. YOU GUYS! Last year the surprise hitter for me was Exile by Kevin Emerson. I mean, I like books about bands, but I was just not that into his Atlantis books so I was kind of skeptical. Long story short, I fricken LOVED Exile. It was super good and I was so on edge for the sequel. I decided to continue reading the series via audiobook, especially as the narrator is so solid. It’s Emma Galvin so I knew that I was in for a listening treat when it came to Encore To An Empty Room by Kevin Emerson. Y’all, if you are interested in Emerson’s Exile books but have yet to begin them in any form, spend your audible credits or swipe your library card to get the audiobooks. They are the best way to experience these reads. So, okay, Encore To An Empty Room picks up exactly where Exile leaves off, so I think if you’ve yet to read Exile you should stop here and then come back to this review when you’ve read it because I just cannot help spoilers and such. Okay so as of the last book, Caleb and Summer and Val and the rest of the band were looking for Eli, Caleb’s famous rock star father’s last songs. These are songs that have never been released to the public and are thus worth lots and lots of money. Meanwhile, Candyshell Records and executive Jason are pursuing a deal with Dangerheart, only Summer is mistrustful of their intentions. Further, another record is also trying to sign the band. And so, the band hits the road – ostensibly for a tour but actually to find those lost songs. What they, er, Summer finds, is a huge game changer. Let’s just say I am AMPED for book three. Okay, so what I love about Encore To An Empty Room is that Summer (Catherine) is on the precipice of deciding between remaining the band manager of Dangerheart and going to college at Stanford. She spends the book vacillating between her choices, leaning in either direction as the pros and cons present themselves in real life experiences. It’s interesting seeing her think about and make actions for her future in such a concrete way. Also, the whole college applications and process is not forgotten but actually included. That is aces. Also, seeing Summer act as a good friend to Val and not out of misplaced jealousy is legit too. Well, the romance between Dangerheart frontman and famous rocker’s son, Caleb, and Summer is put to the test. There’s obstacles like her college choices and then Summer’s talking to her ex Ethan, because she wants to help the band by cashing in on some of Ethan’s success. This isn’t a bad thing because he’s successful pretty much due to her awesome management. Anyways, I just like the different obstacles Caleb and Summer face in Encore To An Empty Room. Relationships are not always easy one hundred percent of the time, so it’s telling to me to see how the two face various problems. 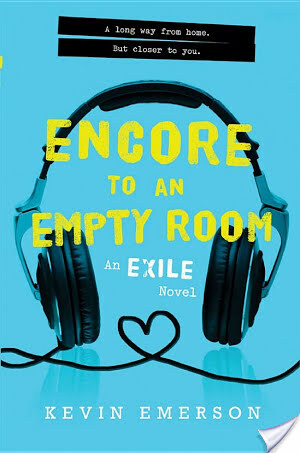 When it comes to the audiobook production of Encore To An Empty Room, I think that Kevin Emerson hit the jackpot with audiobook narrators. Emma Galvin is ever the professional. She embodies summer. I truly believed she was Summer. She’s on point with pacing and just nails it. I honestly think if you’re interested in this book at all you need to listen to the audio version. Nobody got time for loser books and fortunately this is a winner of a book! I just finished this one yesterday and you’re so right, I need the third book, like, immediately!